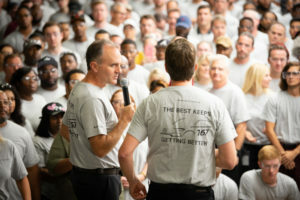 Weeks before the just-announced change of management, Jason Hoff sat down with Southern Automotive Alliance magazine for one of his last interviews as CEO at the Mercedes-Benz Tuscaloosa County plant. The story appears in the Feb-March issue of Southern Automotive Alliance. The first Mercedes-Benz M-Class sport utility vehicle rolled off the German automaker’s Vance, Alabama assembly line 22 years ago. At the time, Daimler-Benz AG, which today is Daimler AG, had invested some $300 million in its new Mercedes-Benz U.S. International (MBUSI) auto assembly plant. In preparation for that first rollout, some 70 trainers from Germany arrived in Vance to instruct the new Alabama production teams, according to the company. 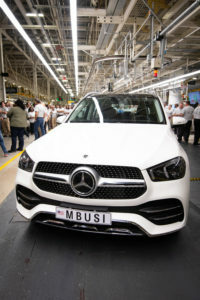 Today, MBUSI team members are producing the car company’s new 2020 Mercedes-Benz GLE SUV. And as the company moves into its next decade in Alabama, MBUSI CEO Jason Hoff opens up about the assembly plant’s plans to manufacture next-gen electrified SUVs and batteries for a worldwide market and its strategies for attracting and training a skilled auto manufacturing workforce for the years to come. The interview took place in the last quarter of 2018. Q: Two years ago, Mercedes announced plans for a $1.3 billion expansion of the MBUSI plant in Vance, Alabama, including body shop and upgrades to the logistics and IT systems. Tell us about that. Jason Hoff: For the most part, that work’s finished. We’re just now launching a new car. We started production a couple of weeks ago where we had the celebration about a week and half ago. So, now we’re getting into the phase of building cars so the last phase for the most part is behind us, and our new body shop is up and running. Q: Tell us about the body shop. JH: It is actually two body shops in one. We’ve basically taken one body shop and coupled it and that’s the whole end of the same building. Each one is capable of a high volume of SUVs and is flexible as new technologies and access allows us to transport the bodies on the floor through what we call automated guided vehicles. Q: In 2017, Mercedes announced plans to invest a billion dollars more toward electrification, including building a logistics hub and a plant to manufacture electric batteries. What is the timeline for those projects? JH: The main piece of our investment is in our new battery plant and our ability to introduce electric vehicles. Our plan is to introduce electric vehicles in our production at the beginning of the next decade. … The equipment is being installed in it and operations will start in that building later this year. The second is the logistics. Construction has started, and our target is to take occupation some time later next year. And then the last piece is the battery plant. We just broke ground on the battery plant so we’ll start ground clearing and other things this fall, and we’ll start construction of the first piece of the building next year. Q: You stated recently in an interview that expansion in Tuscaloosa County is part of Mercedes’ “flexible global network.” What did you mean by that? JH: Well, take for example our new body shop. Our new body shop is capable of building not only our gas SUVs, but also, in the future, our electric SUVs. 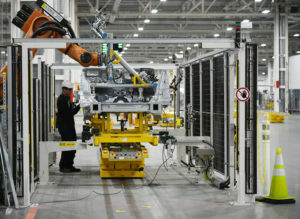 Similarly, our assembly shops will be able to build electric SUVs on the same line like that. So that’s what we mean by maintaining and ensuring a flexible production system, one that is capable of building both electrical and traditional combustion engines vehicles on the same production lines. Q: Are you concerned that the U.S. public’s interest or desire for electric vehicles and hybrids appears to be slow so far? JH: We build for the world market. We export cars to 130 different countries, so we’re looking at the world market and what the demand is for our cars worldwide. And clearly, we see a demand for electric vehicles in specific markets in specific areas. I don’t think anybody has a crystal ball to say what the demand is going to look like in two years, five years, or even 10 years. But clearly, there is a market there, and we’re just trying to make sure that we serve that need. Q: One thing drivers always want is improved gas mileage but they also want the large SUVs. How does your company balance those demands? JH: If you look at when our new SUVs comes out next year and the following years, you’re going to see a significant improvement in fuel economy in those SUVs. 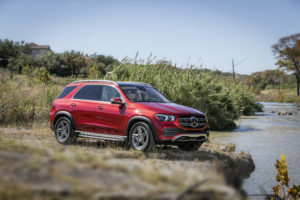 … At the same time, the introduction of hybrids and electrical SUVS is going further to allow people to have a much higher fuel economy or lower emission standards but still not give up the luxuries, the things that they want in a full-sized SUV. Q: How important is workforce development to MBUSI? JH: It’s been a key initiative for us for the last few years in the automotive industry, not only in and around our plants but throughout the state, and, frankly throughout the Southeast. It [the workforce] doesn’t just come out of the existing population, so we need to continue to develop those people, and that’s where workforce development comes in, going out into the schools, whether it be the K-12 system, into the community colleges and even to an extent the universities and making sure that we’re offering the right courses, the right programs to develop the skills needed for the automotive industry, but also to develop the right interest in the automotive industry. Q: Tell us about your apprenticeship programs. JH: We have two main apprenticeship programs. One is geared toward developing people for our maintenance positions. It starts with approximately a two-year program where the person comes out with a two-year technical degree. Then, they would go into further training once they become full-time maintenance members at MBUSI. The other program is geared toward our production area. It also starts with a little less than a two-year program where a student would come out with a two-year degree. But, in that time, they would also get valuable experience in our production facility and be ready for a full-time position in production. Q: What are some other ways you are reaching out to students in the local school systems? JH: One of the major initiatives that West Alabama Works has done is to launch Worlds of Work, which actually took place [Oct. 11, 2018] at Shelton State Community College, where eighth grade students throughout the Tuscaloosa county area come to Shelton State and get to see what industries exist in this area. Each industry has what they call a so-called “world,” and in their “world,” they can educate [students] and inform them as to what types of career opportunities are out there. And we’re doing that at a young age, eighth grade, so they understand that there are lots of different opportunities out there. Not all of them require a four-year degree. In addition to that, we have a lot of high school juniors and seniors coming out there, and we’re obviously trying to tap into them, too, as they’re getting ready to make pretty big decisions in their life as to what they want to do after high school and just making sure that they understand what’s out there and what’s available. Q: What do you expect to see in 2019 and moving into 2020 from the Vance plant in terms of new cars and exciting new features? JH:We just launched our new GLE SUV a couple weeks ago and unveiled it at the Paris Auto Show that same week. We’re very excited about that car. We’ll follow that up with some other successors to our current SUVs like our GLS.